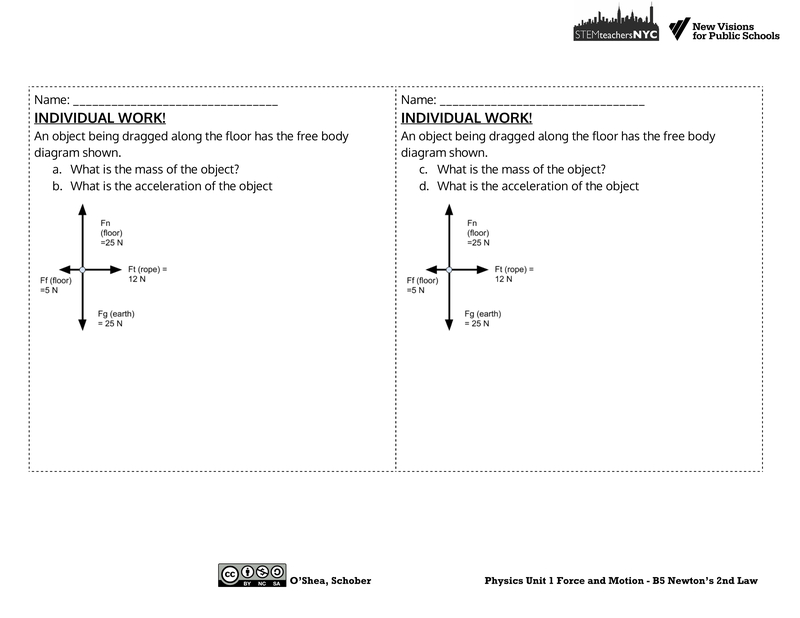 Problem Solving Lab Stations for Unbalanced Forces – Physics! Blog! 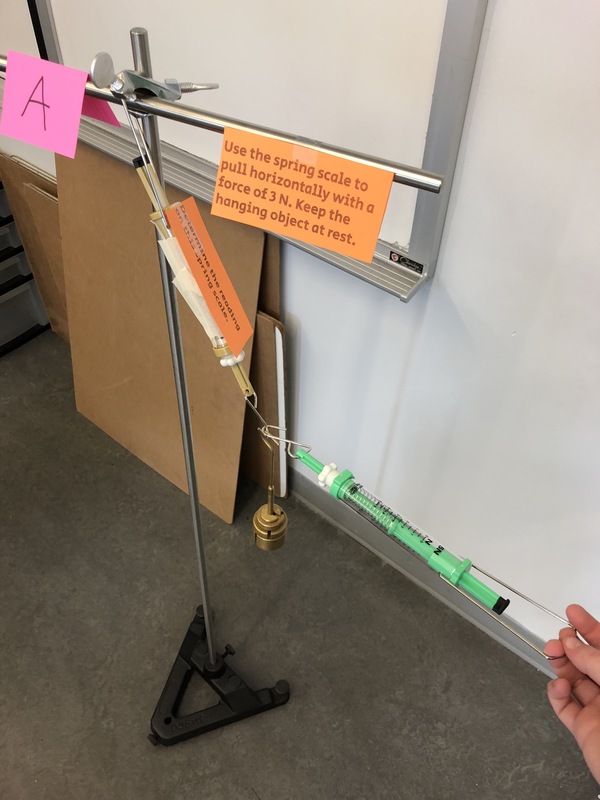 After the success of my balanced forces problem-set-replacing mini lab practicum stations, I wanted to design a similar activity for my unbalanced forces unit. 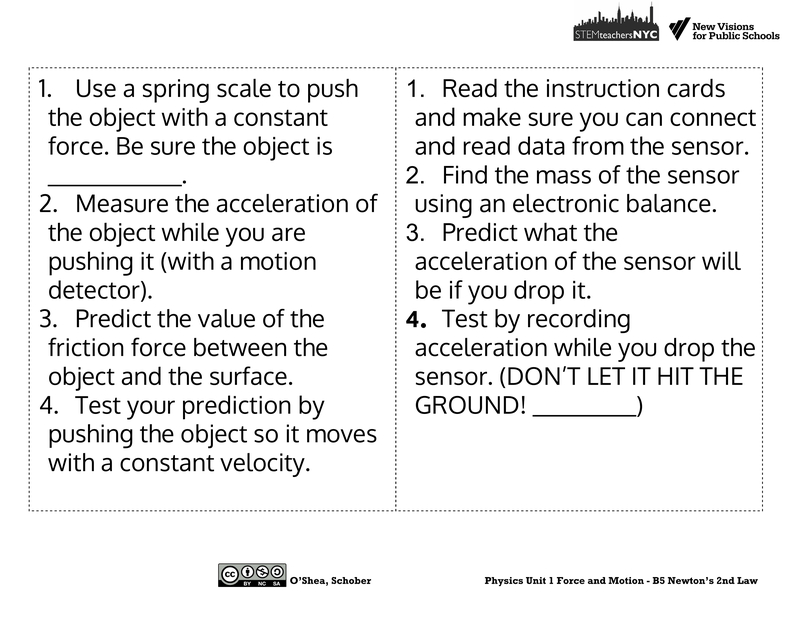 One might think that this would be more challenging (or even impossible) to do since these stations need to involve objects with changing velocities (so the handy flip-up index cards wouldn’t work for checking answers). Challenge accepted (and accomplished, I think). 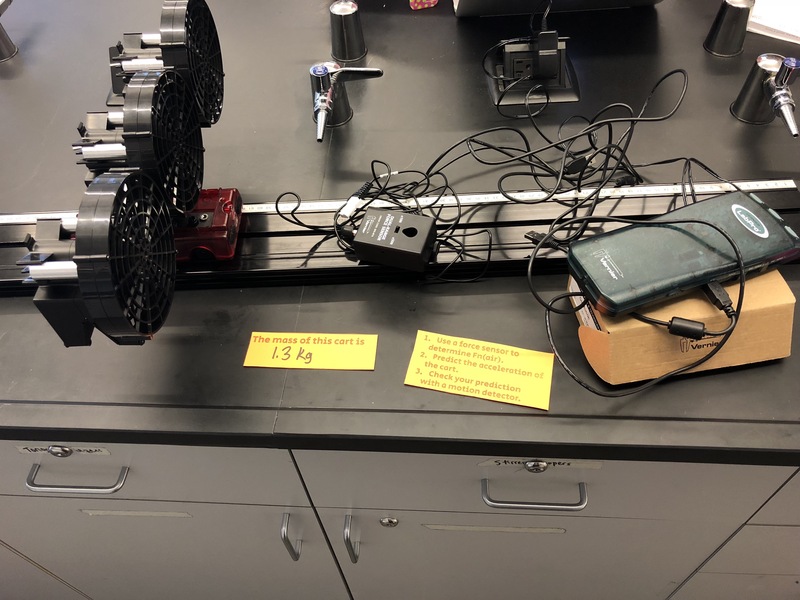 Since this was our 4th unit, students were already comfortable using the force and motion sensors, so these tools could easily be used at stations without much or any additional instruction. 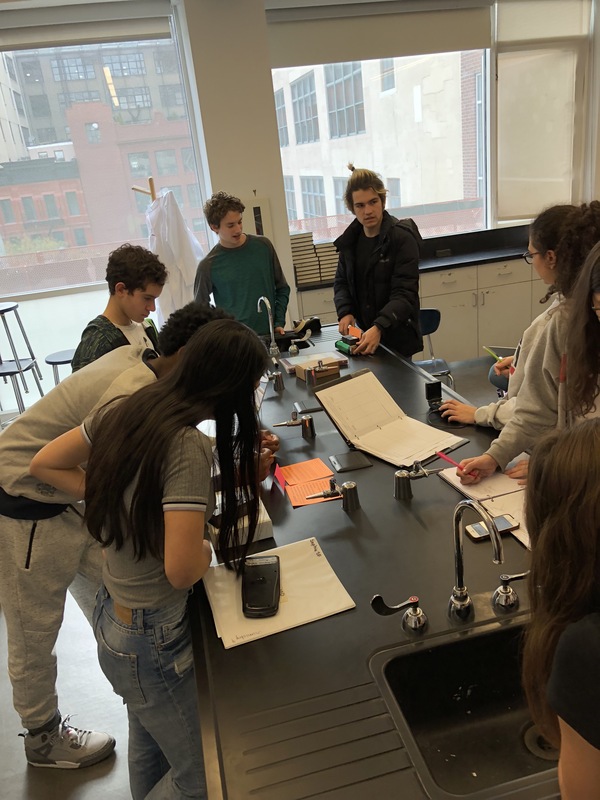 This course is an untracked 10th grade physics class with students in different levels of math, so I limited my first set of stations to situations with only horizontal and vertical forces to keep the focus on the physics concepts and not bury the point with more complex math. By the time we were finishing the unbalanced forces unit, a few weeks later, we had already been working force problems with angles in them, too. 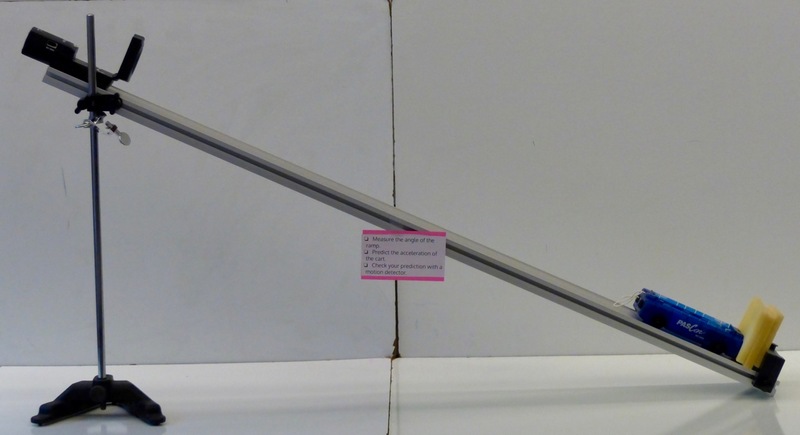 The only balanced force station, this one has a known mass of 410 grams and instructions to pull horizontally with a spring scale so that it reads 3 N.
The numbers chosen work out to make a 3 N – 4 N – 5 N right triangle in the force vector addition diagram. I hoped that by choosing those numbers (and no set of numbers screams triangle to high school students more than 3, 4, 5) it would help reinforce the idea of adding the forces as vectors. 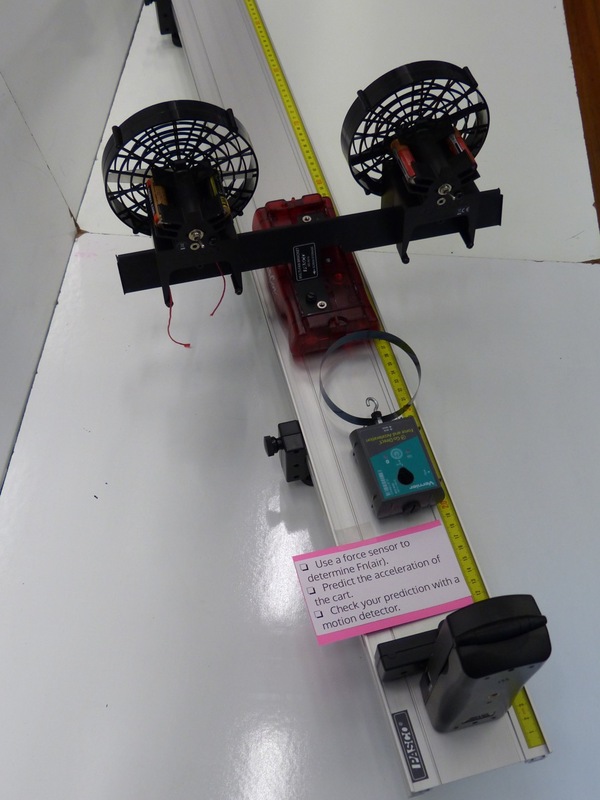 Students use a force sensor (a push-pull spring scale would also work) to measure Fn(air) on the cart. 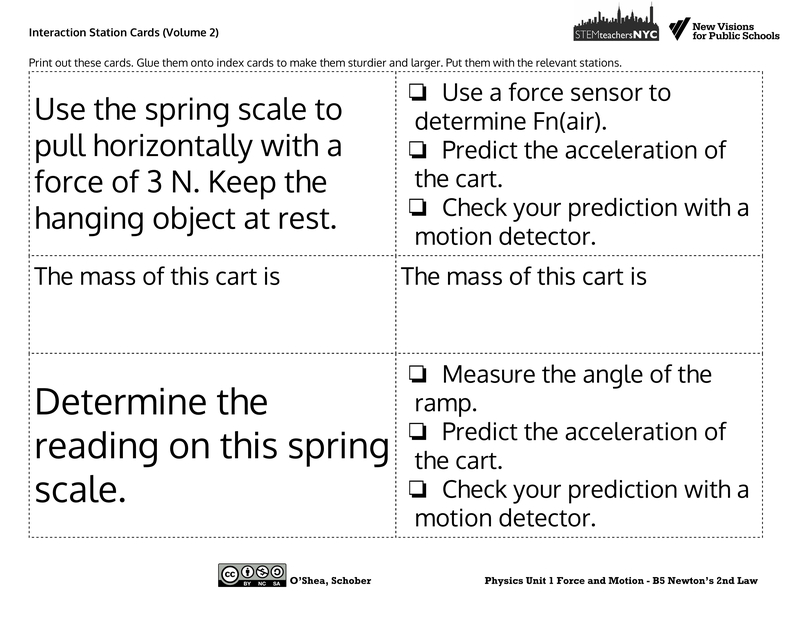 Then they predict the acceleration of the cart. They check their answer with a motion detector. In these photos, I have a setup that includes materials that are (frustratingly) no longer sold by PASCO, but any fan cart setup would work for this station. 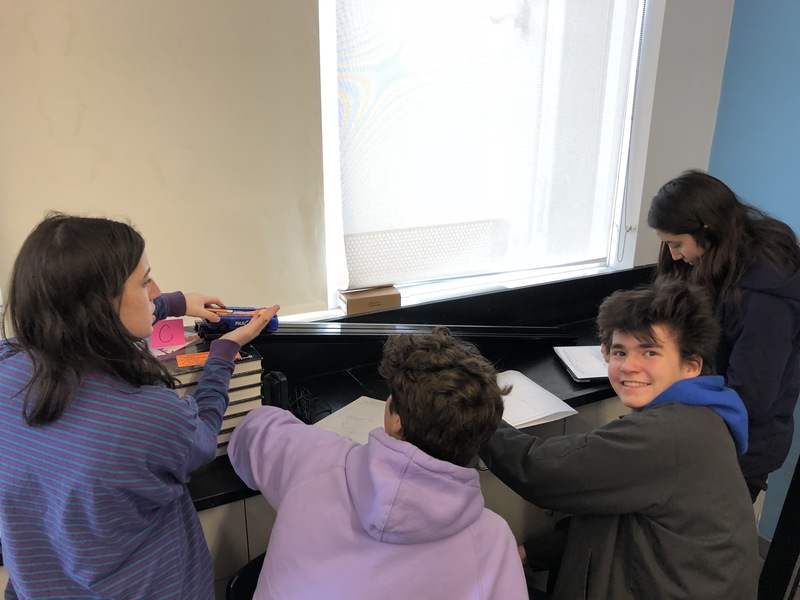 For some of these stations, including this one, I included information about the mass of the object so that I wouldn’t cause a traffic jam or use up time with each group needing to use a balance to find masses at each station. 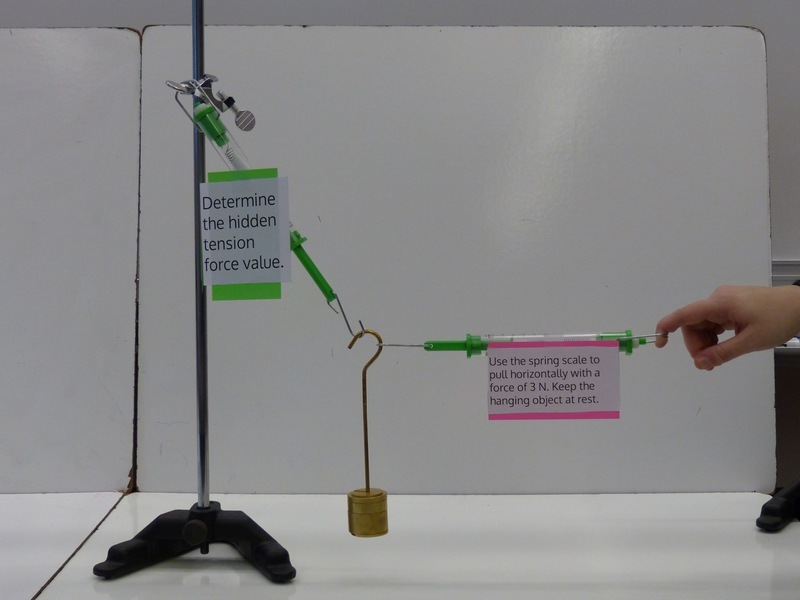 Students push an object with a push-pull spring scale or a force sensor. They are supposed to push with a constant force and make sure the object speeds up. Then they determine the friction force that the object experienced. Finally, they check their prediction by pushing the object so it moves with a constant velocity and measuring their pushing force. This station turned out to be the “aha!” moment station of this set of problems. It’s a bit tricky to implement, so I spent the most time hanging around this station to help various groups get going with pushing the box correctly. They need to take data a couple of times. 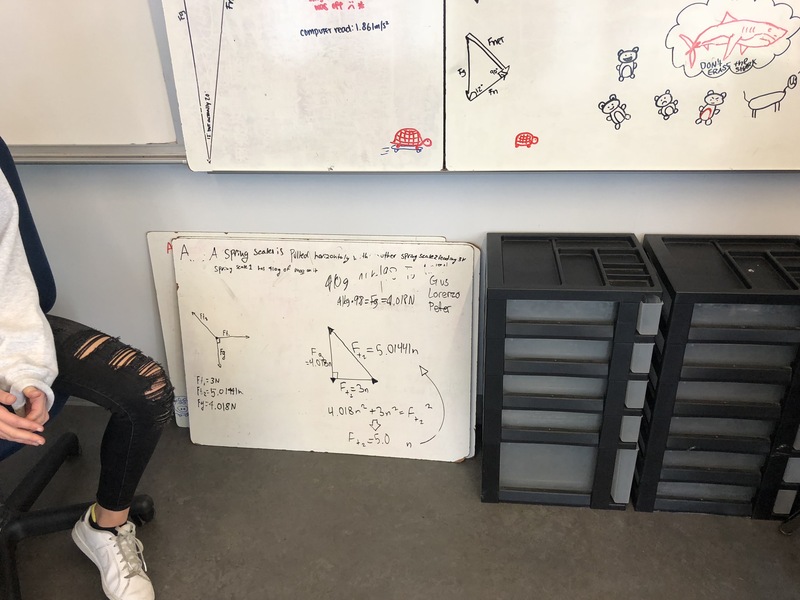 But by the end of this one, especially with the reinforcement of the balanced forces problem to check their work (the card prompts… “Think… why?” and students took that to heart), the understanding of how to work with unbalanced forces and acceleration was practically visible in their faces. Students measure the angle of the ramp and predict the acceleration. They check their prediction with a motion detector. The exit ticket station was useful last time, so I included two exit tickets this time around. In both problems, Fnet is not equal to any one force. 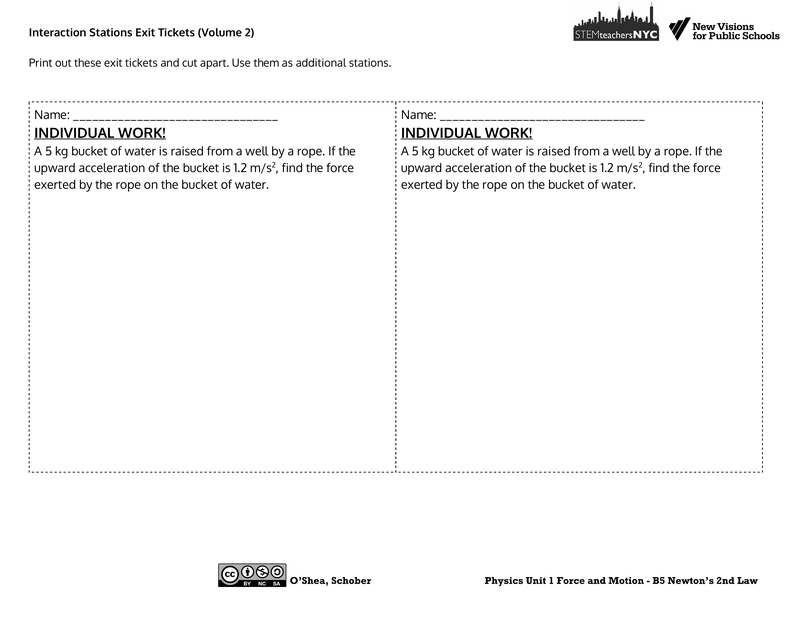 The images of the pages and the editable files are included later in this post with the station cards. Most groups were able to spend time at every (or almost every) station. Everyone did at least one of the exit tickets, and most students did both. This all happened in one 65 minute class period. I made sure that I had more stations than groups so that I didn’t have to make each group spend the same amount of time at each station. The groups chose when to move and which station to attempt. That arrangement worked for the size and nature of my classes, but could easily be adjusted in a different situation. After my Balanced Force version of this activity, it was clear from the exit tickets that students “got it” from the work that day. 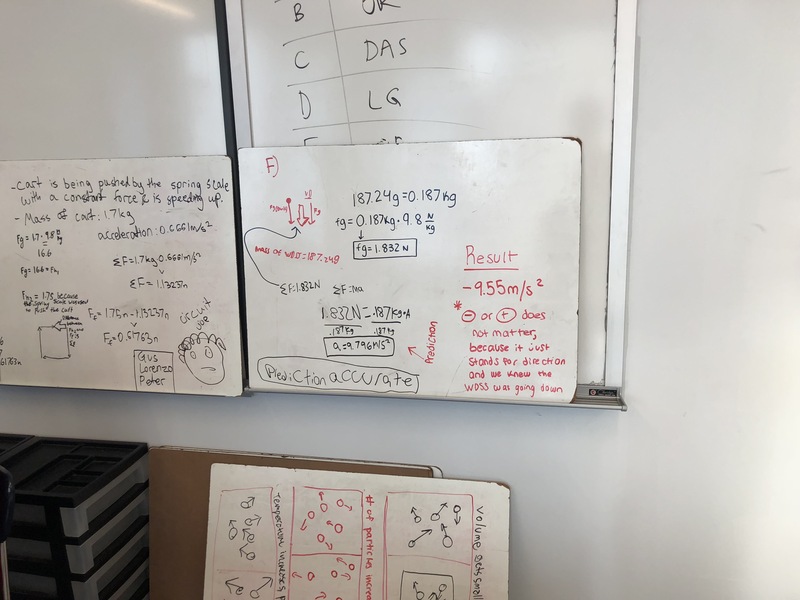 After this activity, with the more complex problems and the forces at angles, I wanted to make sure everyone got a second chance to see and discuss the problems and solutions, so we whiteboarded the stations during the next class. 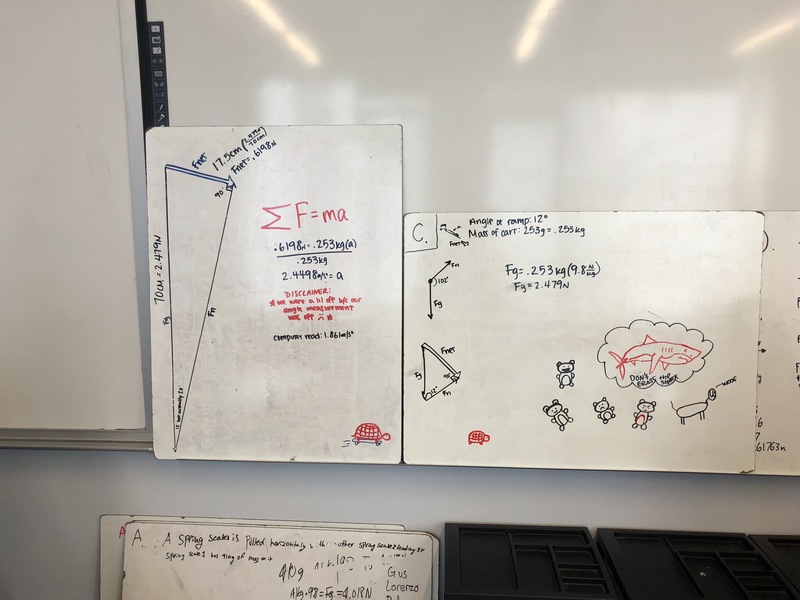 Here are some whiteboards with their (awesome) work, excellent annotations and notes, and very important doodles. As with my previous post, thanks are due to Mark Schober for the photos and to Brian Frank for the inspiration. Kelly, thank you – this such an awesome post. I appreciate the detailed set up info and student work examples! Thank you for your tremendous passion and inspiration. I’m a total newbie modeling teacher, and I am super grateful you are paving the way!